The following is an OpEd piece based on information published by mainstream media and publicly available. This blog article is not intended to be used against any individual or group of individuals. The purpose of this blog article is to give insight into the way many authors view real life events that may or may not provide background for fictional stories that may or may not be written at a later date. Over the last few days, mainstream media, social media, and alternative media have been buzzing with the accusations one woman has leveled against one man. The allegations made by Christine Blasey Ford against Brett Kavanaugh. And a large swath of the connected populous has divided itself into two camps with a few on the sidelines taking a hard look at the facts such as they are. For me, the serious questioning began with this paragraph in a USA Today news article. Mark Judge, the other person Ms. Ford accused in her letter to Senator Feinstein, has no recollection of any such incident happening. But you know, there’s Cristina King Miranda who commented on social media that she heard about the incident shortly after it happened back in the day. She also admitted to having a crush on Mark Judge so who knows what’s going on with Ms. Miranda on that point. Except that Ms. Ford told her couples therapist in 2012 she hadn’t spoken of the incident until 2012. And so Ms. Miranda deleted her social media posts where she claimed to have heard about the assault back in the day after it allegedly happened. Now, it’s a fact that Brett Kavanaugh has been thoroughly vetted by the FBI on several occasions — six between 1993 and 2018 to be exact — not just recently, with nothing suspicious or untoward coming up in their investigations. These investigations aren’t superficial or perfunctory. They are rigorous in nature. How is it that Ms. Ford had no recollection of where or when the attack supposedly happened when speaking with the couples therapist she was seeing in 2012? According to Dr. James Hopper, PhD, and professor of psychology in the Department of Psychiatry at Harvard Medical School, studies have proven that the hippocampus goes into a super-encoding state briefly after fear kicks in, which creates a state where victims of violence remember in incredible detail what was happening, and had happened, up to the point where the fear in an incident kicks in. This means that scientifically speaking, Ms. Ford should have a recollection of where the attack supposedly happened, if nothing else. However, self-described filmmaker, columnist, and writer Mark Judge wrote a couple of books early in his career that include drinking, drunkenness, and immorality as interpreted by the main character’s perspective. In one of those books, he named a character Bart O’Kavanaugh who, according to the book, was known to drink until he passed out. He doesn’t do anything worse than that. He’s just an avid drunk. And neither book describes any incidents of sexual violence. 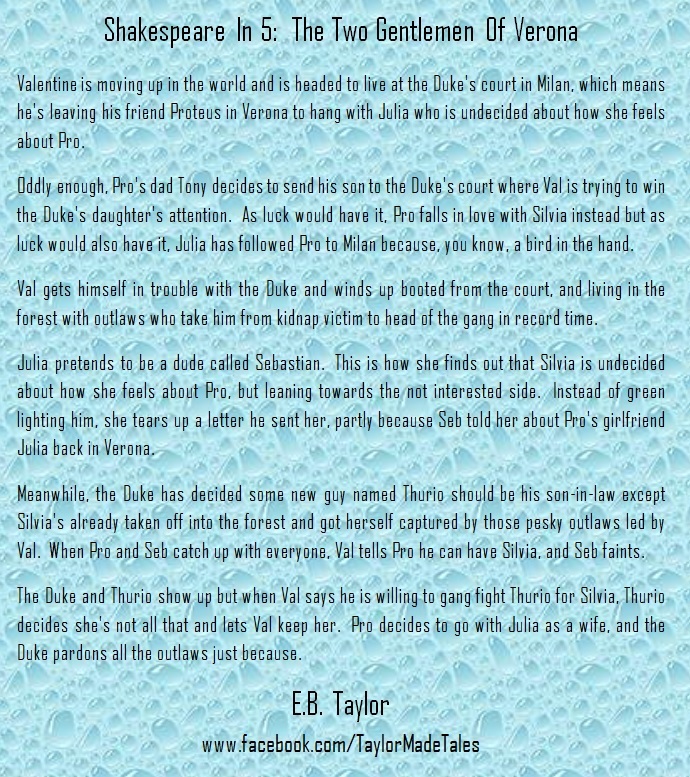 Many authors just starting out (and this happens in Mr. Judge’s first book) give their characters names similar to those of people they have known in their lives. Mark Twain named Tom Sawyer after an acquaintance of his who lived in San Francisco. Walt Disney ensured a friend of his diagnosed with Myasthenia Gravis would be immortalized when he decided to give one of the seven dwarfs many of the symptoms that are part of MG and then named him Sleepy. In “The Fast and the Furious” films, fictional Korean Han Seoul-Oh is a nod to George Lucas’ “Star Wars” hero, Han Solo. For example, Han owned a 1970 Plymouth Road Runner which he lost to another character. Han Solo won the Millennium Falcon from Lando Calrissian. And just like Solo who is a pirate, so is Seoul-Oh. Actually, they are both more cowboy scoundrels than space pirates. But nonetheless they are cut from the same cloth. So it’s not uncommon for fictional characters to have names that are oddly similar to other real or fictional characters. So where does this put the situation in the grand scheme of things? Who knows? We do know that Democrat Senator Dianne Feinstein seems to be distancing herself from Ms. Ford. Senator Feinstein admitted to mainstream media two days ago she “can’t say that everything [alleged by Ford] is truthful” and she backs that up by stating it’s because Ms. Feinstein just doesn’t know. Would this be because she doubts the veracity of Ms. Ford’s claims but sees the political leverage that can be gotten by supporting the accusation even though she has her own doubts about Ms. Ford’s allegations against Mr. Kavanaugh? And what about Democrat Senator Cory Booker? He has no problem vilifying Mr. Kavanaugh based on Ms. Ford’s say so, and yet, he didn’t see anything wrong with his own inappropriate behavior when he wrote about it in a 1992 column for the Stanford Daily newspaper. In fact, he didn’t even apologize for what he did years earlier as a teen. What it looks like right now is that we’ll have to wait for next Tuesday to know the answer to the question of whether there’s going to be a vote for Supreme Court Judge. A lot of William Shakespeare’s plays seem to take place in Italy which is strange seeing he lived in England. Some historians say he did not visit Italy because he did not attend university and only had a grammar school education. Some historians say he was intimately familiar with Italy and must have traveled extensively — at least throughout all of Italy. What some historians are overlooking is that maybe Will had friends who shared their travels and journeys through Italy with him which would make them today’s version of Internet search engines. 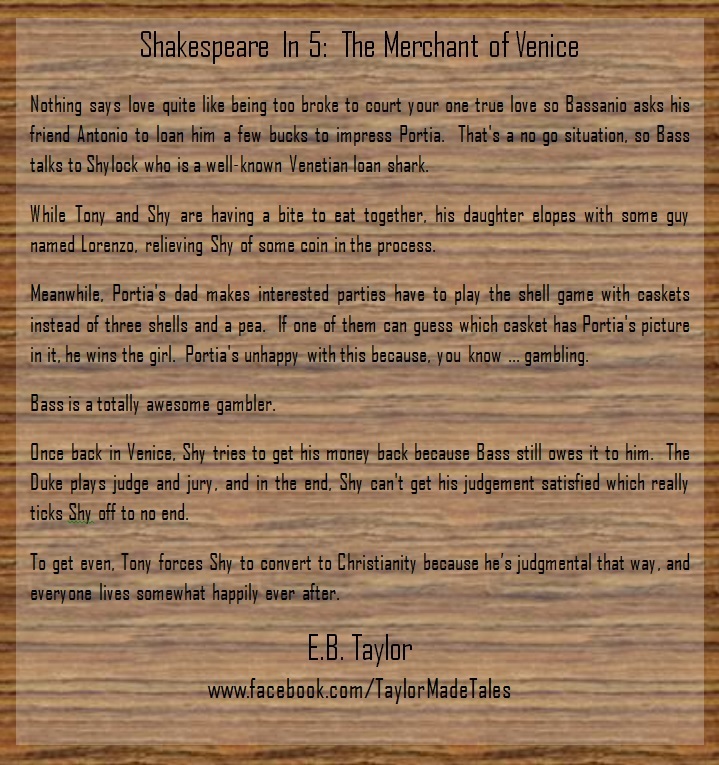 Regardless of how he came by his information about Italy, some of his most popular plays were set in cities in Italy that exist to this day, including Verona and Milan. After a few weeks of enjoying the “Shakespeare In 5” series, I’m certain you have subscribed to this blog. If you haven’t, don’t wait a minute longer! You’ll be glad you clicked that “Follow” button so you can start being the first on your block to read these entries every Friday. Now that you have had a chance to take that Literary Schrödinger Equation in, please remember to subscribe to this blog, and if you haven’t already followed me on other social media platforms, be sure to check them out and follow me there as well. There’s something to be said about the original “Guys and Dolls” style play complete with gambling, crooks, loan sharks, molls, and more. If you’re looking from something new under the sun, chances are it’s already been covered by William Shakespeare in one of his famous plays. Sometimes what seem to be the most convoluted plots are straightforward and easy to understand once you get a feel for the playwright. That seems to be the case with this play as the Literary Schrödinger Equation is applied to “All’s Well That Ends Well” by William Shakespeare. It may have been 1602 when this play was written, but reads like something that might be pitched in Hollywood these days. Check it out. Now if you haven’t already followed me on social media, be sure to click FOLLOW to subscribe to this blog, and find me on these other social media sites. This week’s Literary Schrödinger Equation takes on Shakespeare’s play “A Midsummer’s Night Dream” which is, according to many, one of the most complicated of Shakespeare’s plays to explain. By stripping away the extraneous aspects of the play, it becomes very manageable and relatively easy to understand. In fact, some may think of it as the Elizabethan era’s version of the Keystone Kops. 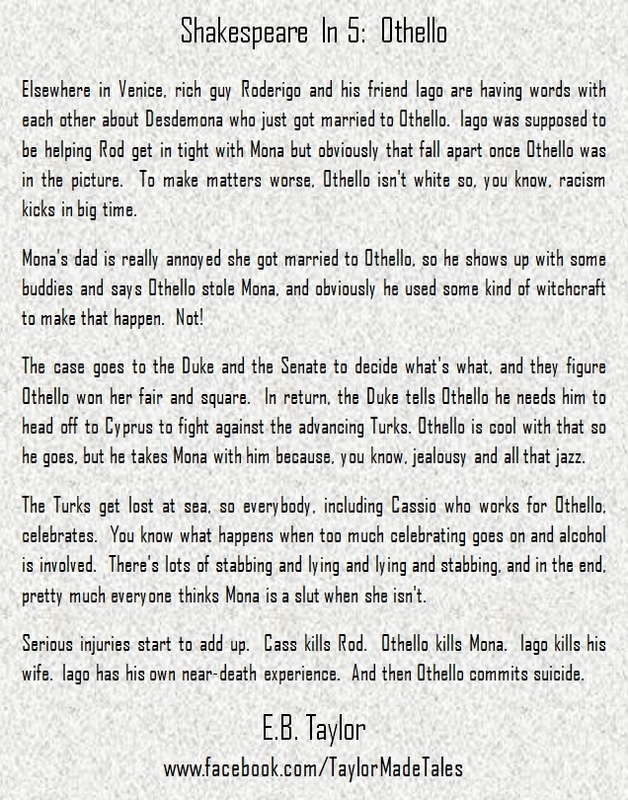 So in a nutshell, this is what the play is about and that’s what happens. Now imagine it being performed as a black-and-white silent movie, and feel free to laugh heartily at the slapstick aspect of Shakespeare’s wit. If you aren’t already following me on social media, here’s where to find me. First things first, I want to remind everyone that because William Shakespeare was English, he didn’t use American spelling in his works. 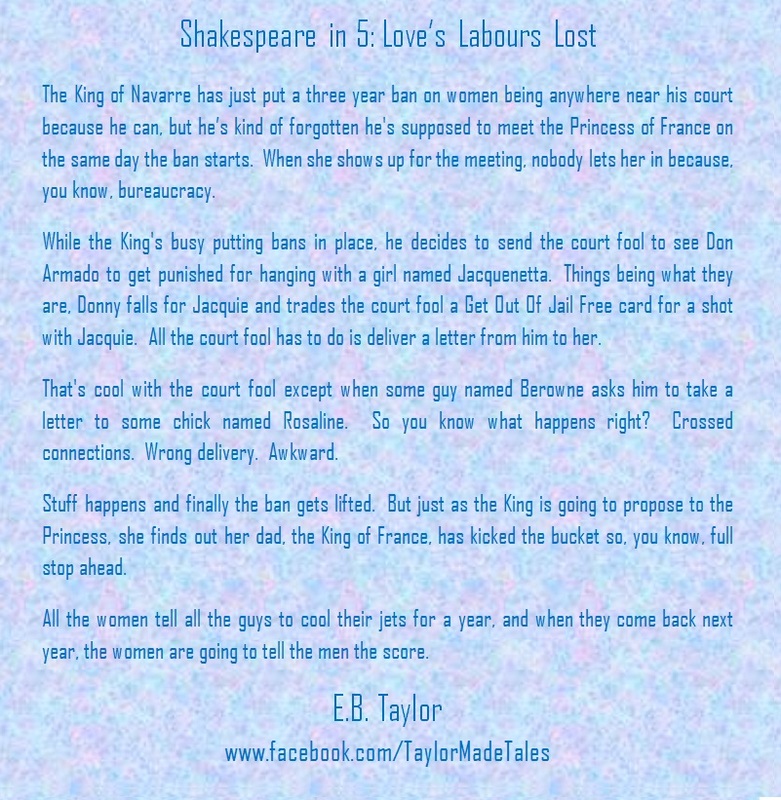 This explains why the letter U appears in the word Labours in the title of his play Love’s Labours Lost. 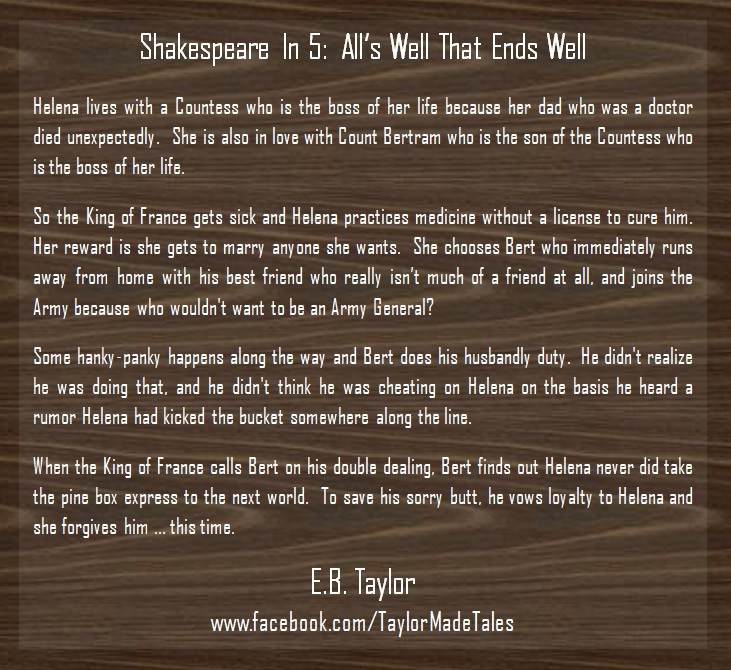 Shakespeare In 5. Now that we’ve gotten that settled and out of the way, let’s see what this week’s Literary Schrödinger Equation has to offer readers. 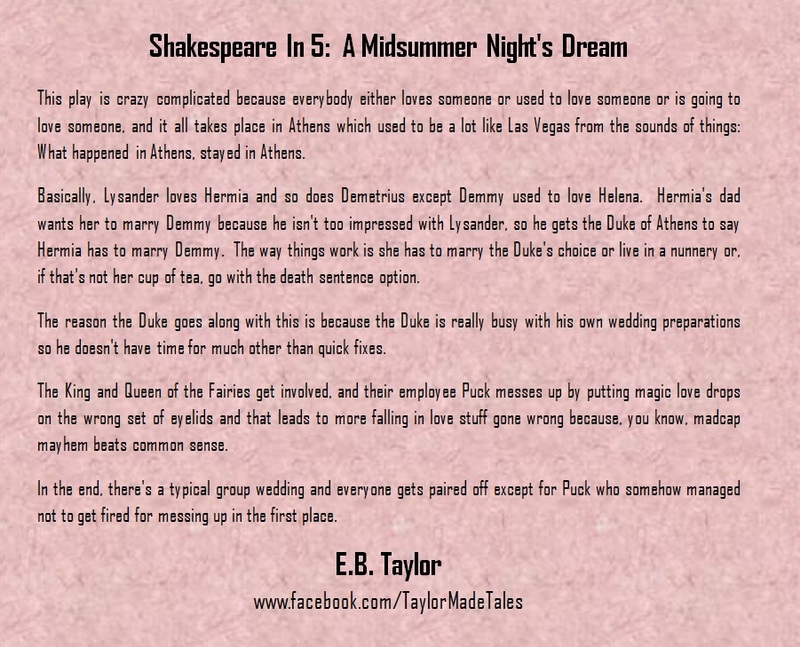 These delightful and informative Shakespeare In 5 entries are the sort of overviews literature buffs or Shakespeare aficionados and everyday people love to share with friends, family, and foes. Be sure to keep the circle of giving going by sharing Shakespeare In 5 with everyone you meet online. They’ll appreciate you for thinking of them, and so will I. If you aren’t already following me on social media, here are some links to make that happen for you, and see you next week!